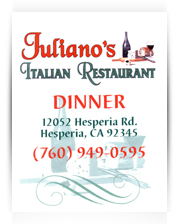 Juliano's Italian Restaurant has been a favorite eating establishment for hungry High Desert folks Since March 2004. 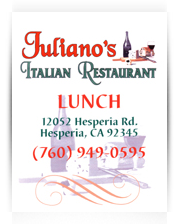 Lunch or dinner, dine in or take out, catering, parties or special events Juliano's Italian Restaurant is the place for authentic Italian food. Juliano and his family take great pride in offering a wide selection of Italian dishes that are as much fun to say as they are to eat. From appetizers, soups and salads to chicken, steak, pork, veal, and seafood dishes as well as a comprehensive wine list and desserts, anyone with a hankering for Italian will be very happy after a meal at Juliano's Italian Restaurant. out for dinner. Whether you need a table for two or an entire banquet facility for your party, come to Juliano's Italian Restaurant. Patio dining is also available. We also serve an exquisite selection of fine spirits and wine. Catering? Si facciamo, Yes we do. Give us a call. Luncheon menu items are available from 11 a.m. to 3 p.m. Monday - Friday. 11 am to 8:30 pm Saturday and Sunday. They are located at 12052 Hesperia Road, just south of Bear Valley Road. 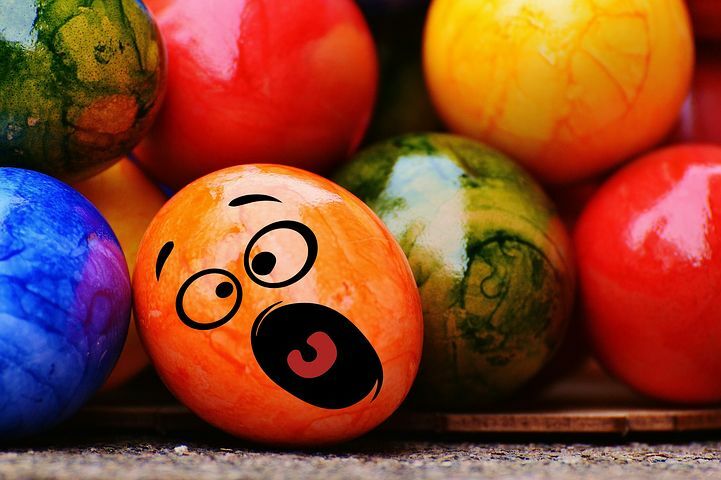 We will reopen on Monday.